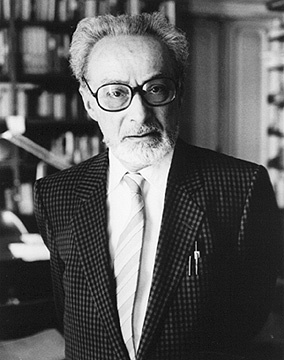 Primo Levi, born in Turin, Italy, in 1919, and trained as a chemist, was arrested during the Second World War as a member of the anti-Fascist resistance and deported to Auschwitz in 1944. His experience in the death camp and his subsequent travels through Eastern Europe were the subject of powerful memoirs, fiction and poetry. Levi died in Turin in April 1987. Some of Levi's writings are more powerful then anything ever expressed about man-made atrocities. 40 years after his imprisonment, in the spring of 1982, Primo Levi returned to Auschwitz ("in the role", as he put it, "of a tourist"). He accompanied a group of students and professors from Florence, as well as some other concentration camp survivors. A Sorgenti di Vita crew went along to document the visit. "Springs of Life" was a cultural television program of the Unione Comunita Israelitiche Italiane, offered bi-weekly by Radiotelevisione Italiana [RAI] on Sunday afternoons. The unidentified interviewer was probably Daniel Toaff, the son of the Rabbi of Rome. The original airdate of this program was April 25, 1983. This English translation is by Mirto Stone. It is here designed over 22 web pages, amongst book covers and portraits as well as some of the many photographs I had taken during a visit to Torino in 1989. To learn more about my own Levi-inspired opera, please visit my web site.